My wife got me Ready Player One for Christmas. It’s pretty good for a kid born in the 70s, and its themes of virtual worlds and their relation to the real world gels really well with a science fiction thing I’ve been working on. Then I started playing Skyrim and any of my doubts about where we’re going were swept away. When I started walking in Skyrim, immediately after exiting the introductory dungeon, instinctually knowing where to look for specific plants, how to fight, and what kind of moons to look for in the night sky – it’s a (real) place I’d stepped into. This is the third game I’ve played in this world, having spent hundreds of hours in Morrowind and Oblivion, and that’s really the thing for me: it’s not so much a game series as a world, a place, to me. The world in Skyrim is just as I remember it from my previous adventures, only prettier, up to today’s standards. In the case of many other games, I would say lack of progress and feeling of familiarity are negatives, but in this case it’s a major pull for me. There will be ever more of these virtual worlds with so much personal and cultural relevance – be it through Minecraft or World of Warcraft or Elder Scrolls – that they really do transcend being “games”. When it feels like you’re logging on or booting up to be somewhere else, to meet people and go about your own ambitions instead of a traditional single player storyline, that’s a place, a world we’re talking about. I don’t think it needs to be an MMO to do this. 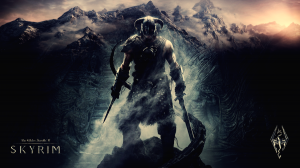 Guys talking about Skyrim never talk about the storyline – they talk about their own ideas of how to play the game. I’ve spent hours crafting jewelry and armor, really proud of my work and figuring out stuff on my own. I think the key is giving the player enough freedom to find their own way and view the world from their own perspective. I’m still trying to get around my general distaste for sandbox experiences. The thing about the Elder Scrolls series may be that they go to an awful lot of trouble to make it feel like a cohesive place instead of a virtual playground (think GTA, Saint’s Row, Mercenaries).